Can one policy change help Los Angeles make room for thousands of additional housing units near transit and alleviate development pressure on current residential neighborhoods? 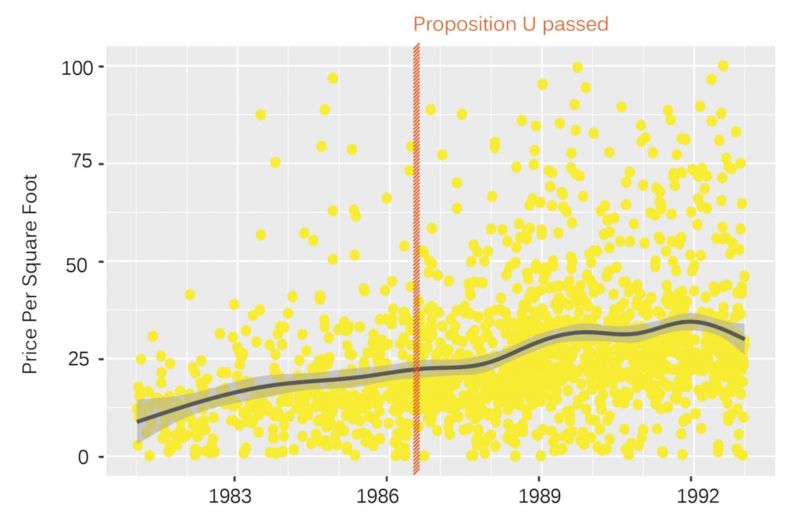 One possibility: Repealing Proposition U. The measure, approved by LA voters in 1986, cut the Floor Area Ratio (FAR) — the relationship between the lot size of a property and the amount of development permitted for that property — in half for most of the city’s commercial- and manufacturing-zoned land. It permanently and dramatically decreased the development potential of LA’s commercial corridors, and has gone down in history as a key driver of LA’s notoriously low-slung urban form (see Figure 1). We studied the impacts of Proposition U and found that the Height District-1 (HD-1) corridors it created have become home to current and future transit stops and a range of retail and cultural amenities, with no discernable effect on the property values of nearby homes. The corridors would be the foundation for walkable, transit-oriented, and mixed-use neighborhoods, and the creation of new space for housing that does not harm the equity of surrounding homeowners — that is, if housing could be built housing on top of retail. As a consequence of Proposition U, however, it cannot, and the full potential of these sites cannot be realized. The LA City Council has tried to get around FAR limitations with some success, including two new Residential Accessory Services (RAS) zoning designations that facilitate housing development with ground floor commercial space. RAS designations have restored residential potential to sites where Proposition U removed it and created an estimated 10,900 units between 2002 and 2010. But use of RAS zones is rare, constituting a tiny fraction of HD-1’s total land area. Thus, they hardly make up for the limited FAR imposed on the entire HD-1 by Proposition U, and are a patchwork solution to a problem that can only be solved by full repeal. When voters were considering Proposition U, the Los Angeles Times urged a “No” vote on the measure, calling it “the most extensive one-shot effort to limit future development in the city’s history.”, So how did it manage to pass by a 2-1 margin? The “pro-growth” contingency that opposed Proposition U included developers and labor leaders concerned that the initiative would prevent businesses from locating in LA. Notably, developers and business associations who opposed the downzoning did so on the basis that the value of their property would decrease. The Boulevard Business Association in Atwater Village stated in an opposition letter that the zoning changes would limit development and reduce the marketability of property on Glendale Boulevard. Both sides believed that tightening land use regulations would benefit homeowner property values while harming commercial values. To date this assumption has remained untested and the impact of Proposition U on land development has been hard to gauge. It came during a lull in the economy when the city was already seeing an overall drop in applications for construction permits. Additionally, historic parcel level research is difficult given the limited availability of point-of-sale transaction data. 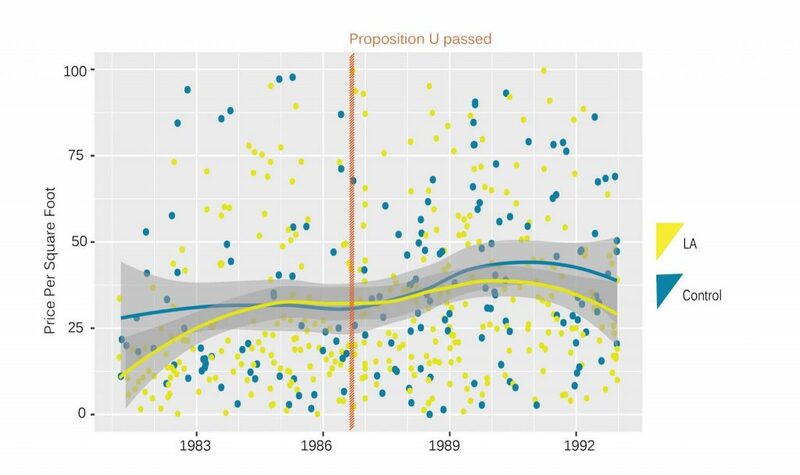 Recent research by UCLA students sought to finally determine whether Proposition U’s regulations depressed commercial values and boosted nearby home values as stakeholders at the time predicted. 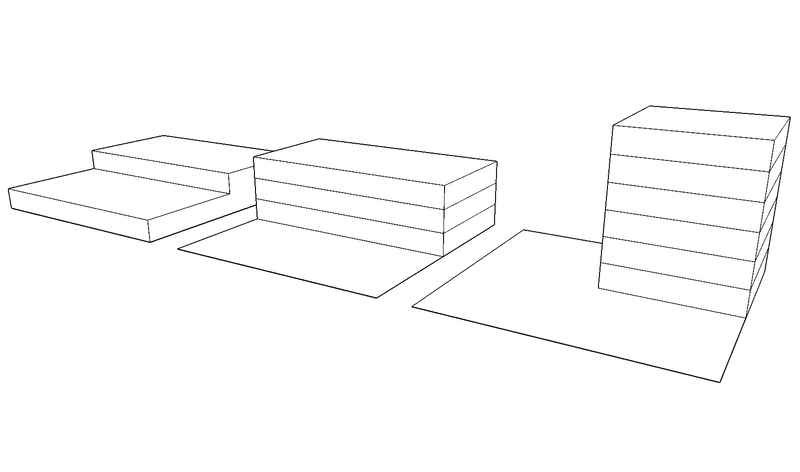 To estimate the property value impacts, we compared eight commercial retail corridors to two different control groups. First, we examined transactions that occurred in these corridors in a six-year period before the passage of Proposition U, compared to a control group of transactions from the six-year period after the measure passed. Then, a treatment group of transactions that occurred in the same eight corridors within LA were compared to a control group of transactions outside the city. Regression models tested for statistically significant differences in the trend in sales prices, before and after Proposition U as well as within LA compared to in adjacent jurisdictions. 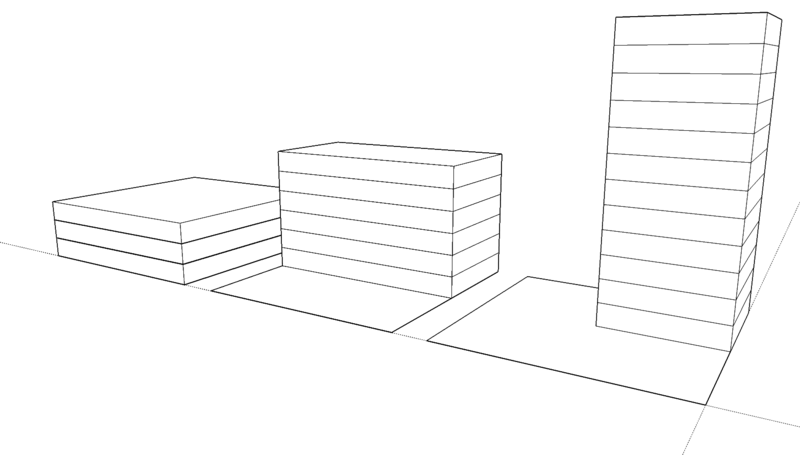 The findings suggest that the value of each commercial parcel is lower due to diminished development potential. In the years immediately following the Proposition U downzone, commercial prices did not experience any broader increase due to scarcity of supply (see Figure 2). As for residential property, prices continued to climb unabated after Proposition U (see Figure 3), but the trend line is too consistent to attribute any boost to the measure, and we conclude that it had no effect on residential property. In brief, commercial prices stagnated after Proposition U while residential prices were unaffected. Based on this analysis alone, the commercial price stagnation after 1986 cannot be attributed exclusively to Proposition U. Confounding factors include the nature of historical controls, substantial data limitations, and the obscuring effect of the dramatic real estate market shifts in the late 1980s and early 1990s. Repealing Proposition U is a critical first step to increasing LA’s housing supply, as it would enable the construction of mixed-use development along commercial corridors. And if resident opposition to density on commercial corridors is based in beliefs about the impact of development on residential values, our study has demonstrated that those fears are unfounded. The only price impact of Proposition U was a reduction in commercial property values. Restoring the development potential of HD-1s would drive private investment to areas that have not yet attracted revitalization, and a repeal could initiate a surge of transit-oriented housing in walkable, amenity-rich neighborhoods. Further, by directing development to underutilized corridors with low housing inventories, a repeal would alleviate pressures on existing residential areas who wish to preserve community character. Paavo Monkkonen is the Lewis Center senior fellow for housing policy and an associate professor of urban planning at the UCLA Luskin School of Public Affairs. Kate Traynor received her master’s degree in urban planning from the UCLA Luskin School of Public Affairs in 2017. Whittemore, Andrew H. 2012. “Zoning Los Angeles : a brief history of four regimes.” Planning Perspectives 393-415. Connell, Rich. 1986. “Prop. U Backers See It as Start of Land-Use Revolt.” The Los Angeles Times, October 12. The Los Angeles Times. 1986. “No on Proposition U.” The Los Angeles Times, October 29. Fischel, William A. 2001. The Homevoter Hypothesis: How Home Values Influence Local Government Taxation, School Finance, and Land Use Policies. Cambridge: Harvard University Press. Pincetl, Stephanie S. 1999. Transforming California: A Political History of Land Use and Development. Baltimore: Johns Hopkins University Press. Kok, Nils, Paavo Monkkonen, and John M. Quigley. 2014. “Land use regulations and the value of land and housing: an intra-metropolitan analysis.” Journal of Urban Economics 136–148. Schrader, Esther. 1987. “Proposal Would Curb Growth in Northeast Area : L.A. Planners to Vote on Down-Zoning Plan.” Los Angeles Times, December 3. Whittemore, Andrew H. 2012. “Requiem for a Growth Machine: Homeowner Preeminence in 1980s Los Angeles.” Journal of Planning History 124-140.